The roots of the club were laid down in September 1946 when the East Anglia Sword Club (EASC) was formed. The EASC was located in the Haymarket where it was part of a Dance and Drama school. The EASC separated from the dance school in 1947 and the title of Norfolk Fencing Club was adopted in 1951. Over the years the club has had many venues but in 2000 the club was invited to relocate to the UEA Sportspark, as the managers were keen to provide a diverse range of sports. The Sportspark was then a newly opened multi-purpose sports facility which had been built within the campus of the University of East Anglia using a Sports England lottery grant. The move was a successful one and the Sportspark has been the home of Norfolk Fencing Club since then. Connie Adam – Connie began fencing in 1988 when she was 60 and subsequently established herself on the national circuit taking every opportunity to compete. She became a member of the British Veterans and has since travelled the world collecting medals and trophies. She has fenced in 20 countries, some more than once. She declared her retirement from international fencing in 2017 aged 89. Julie Henson – Julie began fencing in 2004. She is currently ranked 4th in the UK. Julie has had many, many successes in national event. She is now concentrating on acquiring international experience in the hope of being selected to represent GB in the Commonwealth Games in 2018. Edward Hudson – Edward started fencing at Bath Sword Club aged 16, inspired by the exploits of Somerset fencing hero Bill Hoskyns, World Champion and Olympic silver medalist. Edward was junior epee champion in 1969 and British epee champion in 1973. He represented Great Britain at World Fencing Championships in 1971 and 1973 and was on the men’s epee team in the ill feted 1972 Munich Olympics. 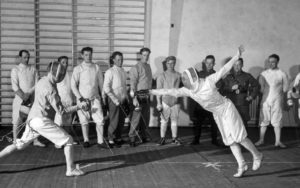 Mick Meyer – Mick’s fencing career spanned his service in the RAF during which he fenced in many countries often joining local fencing clubs. Further to this he was awarded an RAF Blue. He went on to become the Combined Services Champion in epee and foil in 1966. Since joining the British Veterans (previously known as the National Veterans established in 1987) he has fenced in a number of international championships, including the Vets Commonwealth Championships where he has secured gold, silver and bronze medals as part of the epee team and most recently, in 2016, a silver medal in the individual event. John Croxon – John is another well-travelled veteran. He took first place in the 2000 Commonwealth Championships along with a number of other top 10 places in national veteran events. He has received local awards recognising the work he has done enabling the disabled, especially the blind and visually impaired to experience fencing.